Galerie Uhn's brochure for my upcoming solo exhibition just went out, a copy below. The work is all finished and framed, ready for the long drive to Germany in a couple of weeks. I'm renting a long-ish van for trek, as some of the work that I'm bringing for this show and our CKCK group exhibition is too large for my SUV. Shipping so much work is cost-prohibitive. Eurotunnel, here I come - oh, the glamorous life of an artist! 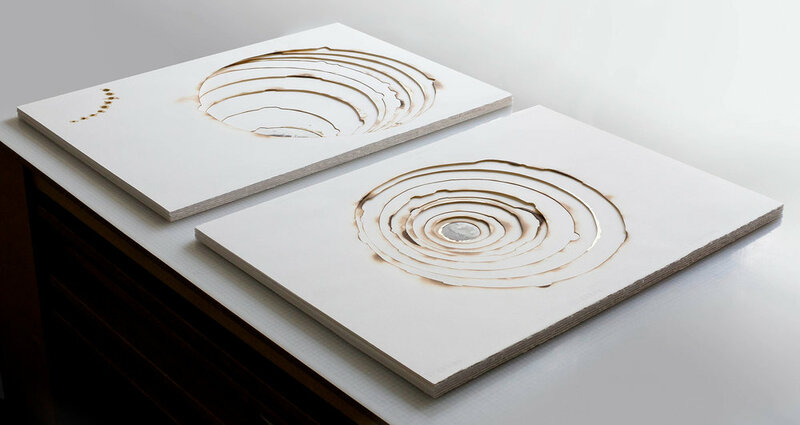 In recent months, my Playing With Fire commissions have evolved from dimensional pieces constrained by a mat and frame, to floating sculptural objects, unconstrained by form. Kelly M. O'Brien, Playing With Fire No. 47 (Edgy 1). Paper, book thread, flame. 14 x 14 x 2 7/8 inches framed. ©2017. My new obsession has become the edges of these burned stacks of paper. While I give love and attention to every detail of a commission, I've been dreaming of how to celebrate their edges. Burning down the house. Work in progress. Kelly M. O'Brien ©2017. 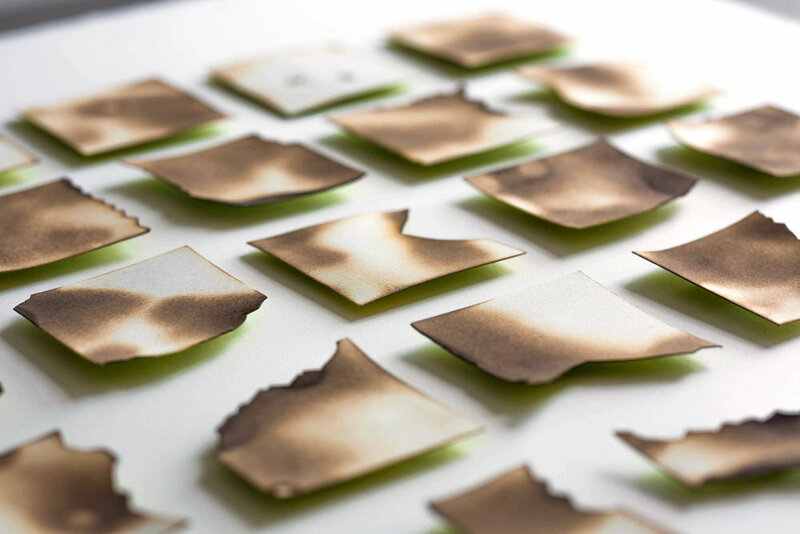 Enter Edgy, a series of small burned paper objects that flip the stacks on their sides and make each object all about this tiny but gorgeous feature. I've only just begun this series and am eager to see where it takes me. Kelly M. O'Brien, Playing With Fire No. 49 (Edgy 3). Paper, flame. 14 x 14 x 2 7/8 inches framed. ©2017. Edgy will eventually show up as a grid of nine framed pieces – and probably a few special ones left unframed – in my solo exhibition with Galerie Uhn in September, details below. Kelly M. O'Brien, Playing With Fire No. 48 (Edgy 2). Paper, flame. 14 x 14 x 2 7/8 inches framed. ©2017. When a private collector came to me wanting one of my Playing With Fire pieces for her home on the water, I was excited to see where coastal inspiration took us. I presented three sketches, all slightly different takes on her theme. The client and her husband selected sketch #1. This one was actually my favorite, inspired directly by the topography of where their home is located in Connecticut on the Long Island Sound. Place and homeland have featured prominently in my work since moving overseas from the US in 2011, but not necessarily in my Playing With Fire series. Here was an opportunity to marry the two – my more abstract work with themes and inspiration that are close to home. This has been one of my larger burned paper pieces to date, so safety was paramount in what I fondly call The Burning Shed. I use an unfinished stone out-building on our property to do this kind of work, complete with stainless steel workbench, certified respirator, fireproof jumpsuit, fire blanket, fire extinguisher and ventilation fans. Action video below! Kelly M. O'Brien, Playing With Fire No. 40. 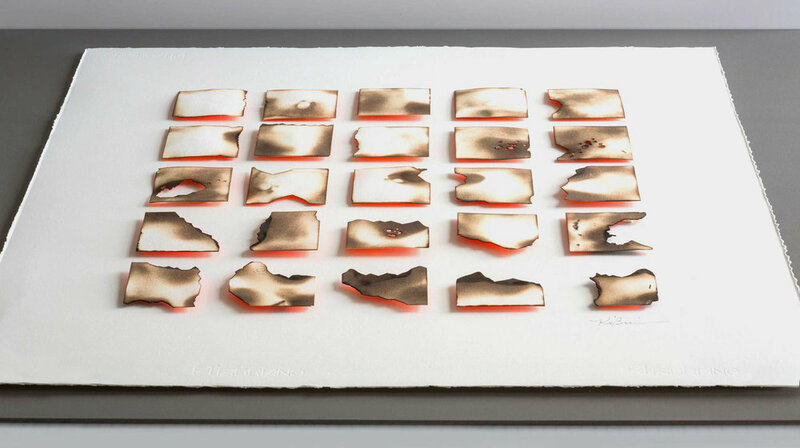 Paper, gold leaf, flame. 52 x 47 x 2 inches. ©2017. Private commission. Something that excites me about this piece is that the work is becoming more object-like and sculptural. 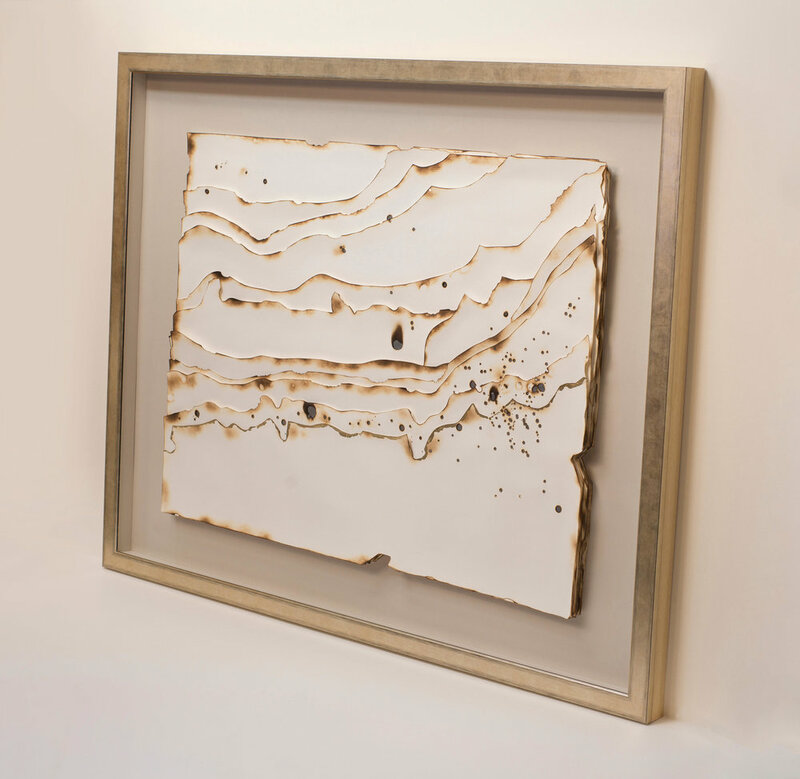 By floating the artwork inside a larger frame, all sides of the piece come into play. In this case, the object's irregular shape was informed by the state of Connecticut, but the float allows me to be otherwise unconstrained by the rectangular shape of a frame. Stay tuned on this idea! Kelly M. O'Brien, Playing With Fire No. 40 (detail). 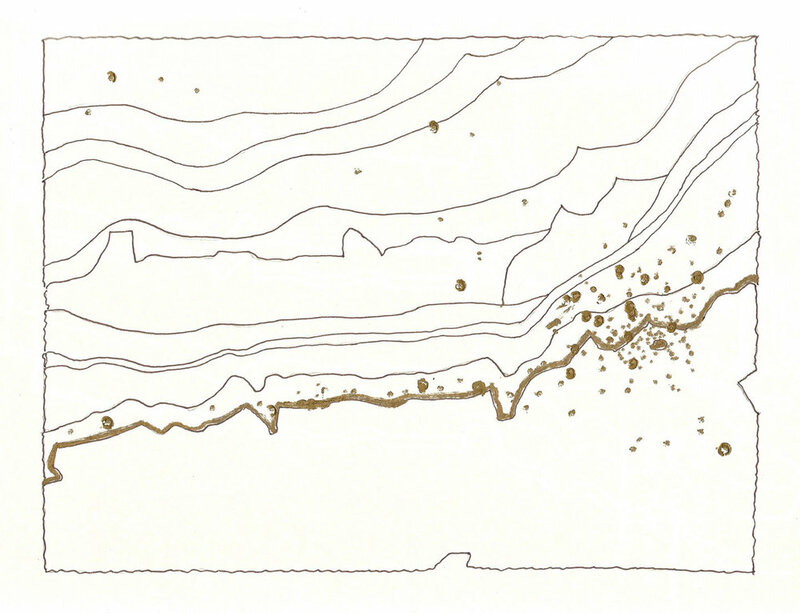 Paper, gold leaf, flame. 52 x 47 x 2 inches. ©2017. Private commission. The path from sketches to finished product was a bit more complicated for this commission. The size of the piece presented some framing challenges, mainly due to color restrictions for the larger mount board (matting) on which the artwork floats. The client's interior designer specified Pantone colors for my framer to match, which meant the board had to be painted. The UK uses a different color system, so we had to visually match Pantone paint sample cards to the RAL system here. All very geeky and boring if this isn't your thing! Luckily, it is mine, and we got it right in the end, thanks to the patience and professionalism of my framer, Ian Pittman and his team at The Framing Workshop in Bath. Another challenge was creating something interesting and layered without making the final framed work too deep, as the artwork hangs on a wall over which a large flatscreen TV glides up and down. Instead of simplifying the design, I found ways to retain the layering while staying within the client's design specs. Overall, I'm really pleased with how this piece turned out. Many thanks to the team at The Framing Workshop in Bath, to HMC Logistics for the TLC of their art handlers and expertise to get the final product safely into the client's hands, and a huge thank you to this collector for the opportunity to create something special for their home.